SAN FRANCISCO (Takeda Pacific HighTech Reports), Moscone West, January 30, 2013 — MacWorld/iWorld 2013. NASA experts spoke about NASA’s Curiosity Mars Rover and its connection to Apple products at a meeting here. The session was titled “Software, Hardware, and Flying to Mars. How We Built, Programmed and Operate NASA’s Curiosity Mars Rover.” David Oh, Lead Flight Director and Software Engineer at JPL/Caltech Mars Science Lab, asked the question, “Why are we at MacWorld?” The answer was shown in a slide of the NASA control room at the JPL in Pasadena, California. On the desk was a mixture of Apple products such as MacBook Pros, iPhones and iPads during the Rover’s Mars landing. The Macs were running Mac OS X.
Ben Cichy, Chief Flight Software Engineer, compared the processing power of the iPhone 5 to Curiosity’s processing power. The iPhone 5 has 1.3 GHz and the Curiosity has only 132 MHz. In addition, the iPhone 5 has 1GB of memory and 64GB of storage and the Rover has 128MB of memory and 4GB of storage. The cost of an iPhone 5 is $399 while the cost of the Curiosity was $1.8 billion. During the session, the audience was shown a video of the landing of the Curiosity on Mars. It only took 7 minutes, but a very tense 7 minutes. It was very exciting watching the landing of the Mars Rover all over again. “The Rover’s goal is to explore and see if Mars ever sustained life or is now,” Ben said. David showed a slide that described the different parts that make up the Rover. He added that the heart of the mission is the SAM (Sample Analysis at Mars). The SAM analyzes the chemical and isotopic composition of the planet’s atmosphere and surface. He said that the “Curiosity has two brains (computers) in its belly. One is the primary computer and the other is the backup.” This time social media plays a big part in providing people access to seeing what is happening with the Curiosity as it explores the surface of Mars. The Curiosity has its own Facebook page and iPhone app. Jay and I attended Macworld 2011 at San Francisco’s Moscone West last Thursday (1-27-11). The place was packed. People from Macworld said that maybe 25,000 to 27,000 Apple fans would come to this annual event. 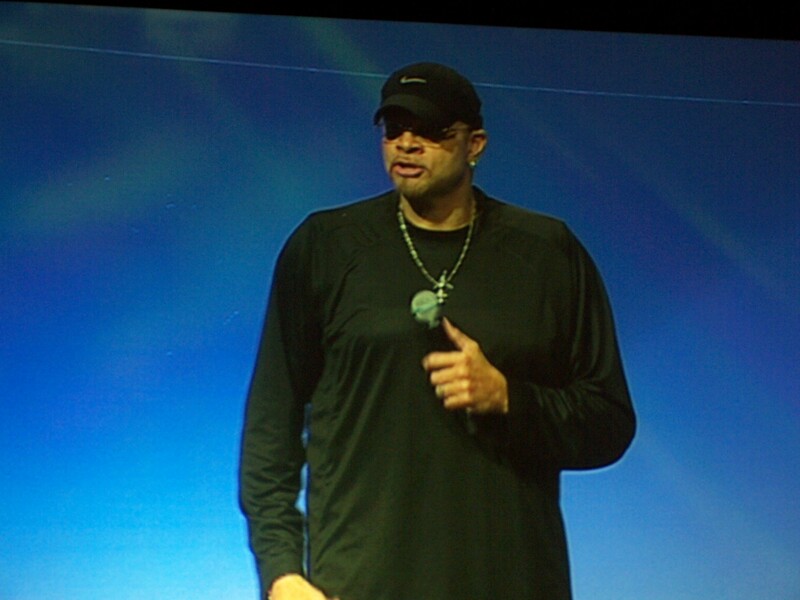 The highlight of the day was the keynote with actor and comedian, Sinbad, which drew a huge crowd. Sinbad is very funny guy who is a big fan of Apple products from way back. He said that his first product was a Macintosh 512K. However, he was not afraid to point out problems with some of the Apple products such as poor reception with the lastest iPhone. At the end of his keynote, he introduced a new product coming out called the iPill, which is a giant suppository to turn your brain into a computer. The thing was larger than a pizza. Let’s just say the whole thing was a big joke and got huge laughs from the audience. Speaking of the iPhone and Hollywood, we attended a very interesting session on Mobile Movie Making. Two aspiring filmmakers, Michael Koerbel and Anna Elizabeth James from USC, shot an action TV pilot called Goldilocks using only iPhone 4s and iPod Touch 4s. One of the actors in this pilot is Carlo Rota who also acted in the TV show “24.” His character’s name on “24” was Morris O’Brian. Michael and Anna showed off the various attachments that help turn their iPhone 4s and iPod Touch 4s into very low budget film making equipment. What made the iPhone 4 platform work well for them, was a special camera mount and lens adapter called an OWLE Bubo and a camera App called Almost DSLR. The whole project took only 20 days instead of many weeks it would normally take to film a TV show. Their low budget movie cost about $2,000. I was very impressed with the quality of the film. The video series can be seen via the Majek App on iTunes. The USENIX/ Lisa (Large Installation System Administration) ’10 Conference was held at the San Jose McEnery Convention Center during November 7-12, 2010. The event supports attendes from the community of large IT systems administration with education sessions, BOF meetings, vendor exhibitions, receptions, and social networking opportunities. About 1,500 attendees participated at this interesting event. I attended a talk about Postfix. Wieste Venema, a researcher from IBM’s T.J. Watson Center, gave a talk called Postfix: Past, Present, and Future. Wieste discussed his experience that he had with the postfix mail system over its 12-year history. He said that since its release by IBM as an open source mail system, Postfix has gone on to become a proven part of mail system infrastructure. Postfix is used in ISP server infrastructures that manage millions of email boxes. Wieste explained that after IBM completed Postfix in 2006, development work shifted the focus to expanding its functions, making it extend to other areas and to become more adapatible to changing demands such as resisting external threats from malware. Speaking of external threats, Wieste made a special observation about the problem of persistant overload that occurs before the smtpd connection filter. He noted that there was prior work in the field such as OpenBSD spamd, MailChannels, TrafficControl and work by M. Tokarev. He said that spammers can setup networks of millions of hijacked PCs called ‘zombies’ to invade and overwhelm email servers with spam junk. Postfix helps email systems resist zombie attacks. I also attended a few more talks, the vendor exhibition, and two receptions. My observations of this conference made it clear to me that attendees can gain many benefits of the various educational sessions, BOF meetings and personal networking opportunities that the USENIX made available.